It all started with my aunt producing this item out of her bag. 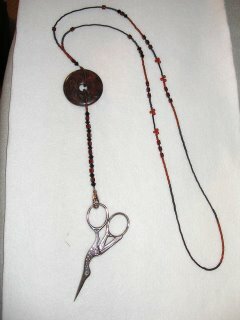 A scissor chatelaine to keep track of her scissors while we were at the ANG meeting. That was the same day we headed to the bead store after and I came upon a few of the discs that hold the 2 chains together and just couldn't resist. Now, mind you, I changed a few things as I couldn't find all the exact beads but I'm extremely happy with the finished product. I made mine a bit longer as I occasionally have my hair up and I didn't want to chance it getting caught on my hair and being a problem. 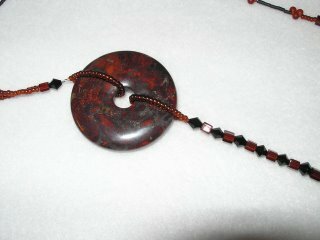 Here is a close up of the center disc so you can see the colors of it, the previous shot is a bit drab. 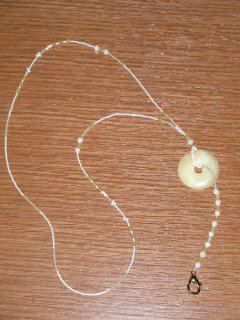 It actually has a nice marbled color that compliments the beads perfectly. As long as I had all my beading tools out I did some re-assembly on these two scissor fobs. I made them both from kits but the kits came with nymo thread that just didn't hold up with regular use (and abuse) of my scissors. They're now both restrung with more secure fiber so hopefully they will last a few more years. What a preety disc on your chatelaine! Very nice fobs!! The ring is a unique idea - I like it! I like your beading, very nice. Nice idea your aunt had too. Thanks for stopping by my blog. Your fobs are gorgeous. Something else new to me...... first linen, now fobs - gotta catch up with the times. 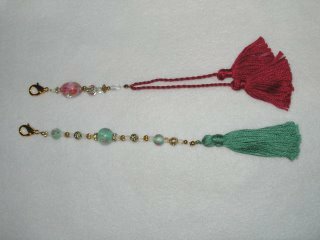 Wow, beautiful chatelaine and fobs! Well done!